The Wall Street Journal had reported on Sunday that Tesla had turned to some suppliers for a refund of previously made payments in a bid to turn a profit, citing a memo sent by a Tesla global supply manager. Concern that the memo signalled that money-losing Tesla was scrambling to find cash to fund its current operations and multiple long-term projects had sent shares down. 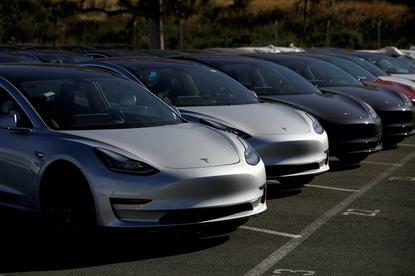 A Tesla spokesperson said the electric vehicle maker had asked fewer than 10 of its suppliers for a reduction in "total capex project spend for long-term projects that began in 2016 but are still not complete." Any pricing adjustments would improve Tesla's "future cash flows, but not impact our ability to achieve profitability in Q3," the spokesperson added. Tesla shares pared losses and were down 2.7 percent at US$305.01. Cowen analyst Jeffrey Osborne told Reuters that Tesla's supplier explanation appeared "rational", but that there remained lingering concerns. "We still have the same concerns, though, about general cash flow needs for the company, production quality issues, automation or lack thereof, as well as concerns on profitability..." Osborne said. Tesla has been burning through cash as it ramps up production of its Model 3 sedan. Chief Executive Officer Elon Musk has said the company does not need to raise cash this year, but several analysts have predicted that the electric car maker would need to raise capital soon. Tesla had about $3.2 billion in cash as of March 31, after spending about $1 billion in the quarter. Tesla said Monday, "Negotiation is a standard part of the procurement process, and now that we're in a stronger position with Model 3 production ramping, it is a good time to improve our competitive advantage in this area." "We're focussed on reaching a more sustainable long-term cost basis, not just finding one-time reductions for this quarter," the spokesperson said. Musk tweeted: "Only costs that actually apply to Q3 & beyond will be counted. It would not be correct to apply historical cost savings to current quarter." Tesla has said the company will be profitable in the third and fourth quarters of the year. It posted a loss of $709.6 million in its first quarter. In June, Tesla said it was cutting several thousand jobs to become sustainably profitable without endangering the ramp-up of Model 3 production. Reporting by Vibhuti Sharma in Bengaluru; Writing by Alexandria Sage in San Francisco; editing by Patrick Graham and Nick Zieminski.